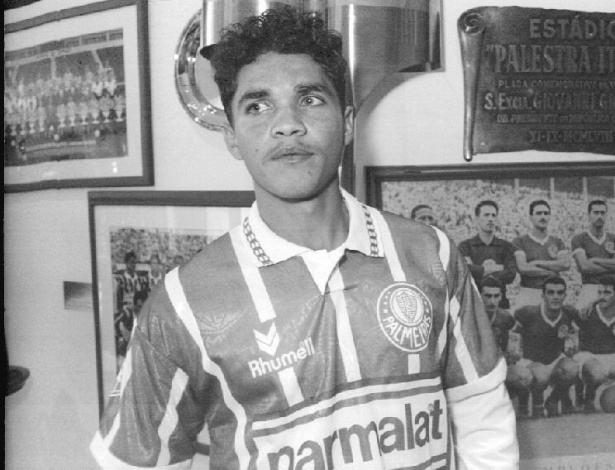 Alex Alves pulls on the Palmeiras jersey for the first time in 1994. On the morning of this 13 November, 37-year-old Alex Alves – 1994 Brazilian Champion with Palmeiras – lost his battle against cancer. The forward, with passage through Vitória, Palmeiras, Portuguesa, Juventude and Cruzeiro before pulling on the jersey of German club Hertha Berlin, became known for his capoeira-style goal celebrations and fancy hairdos. His return to Brazil in 2003 marked the beginning of a declining career, with modest appearances for Atlético-MG, Vasco da Gama and again Vitória before playing for a number of smaller clubs. At Palmeiras he played 53 games and scored 11 goals. Absent from the pitches since 2010, he fought leukaemia for a total of five years. Alex Alves leaves a daughter.